On October 30, 2013 the Walt Disney Company made a surprise announcement that it was acquiring Lucasfilm, home of the immensely successful Star Wars brand, from its founder, George Lucas, for $4.05 billion, split evenly between stock and cash. Lucas was the sole shareholder in his company. The acquisition bolstered Disney’s status as a leader in animation and superhero films and gave it the opportunity to reap huge earnings from the already lucrative Star Wars media and merchandising empire. Disney promised to begin producing and releasing new films in the Star Wars franchise every two or three years. The acquisition even included a detailed script treatment for the next three Star Wars films. On April 12, 2012, the United States Department of Justice (DOJ) sued Apple and five major U.S. publishers for colluding to raise the prices of ebooks. Three of the publishers settled the suit; two others and Apple were unwilling to settle. In January 2010, the publishers had negotiated a new business model for ebook pricing with Apple as it prepared to launch the iPad: in exchange for a 30% sales commission, Apple would let the publishers set their own prices for ebooks. For the publishers, this pricing model appeared to be a vast improvement on their wholesaling arrangement with Amazon. After at least one of the publishers threatened to delay release of its digital editions, Amazon reluctantly replaced its flat $9.99 price for ebooks with Apple’s model, and prices rose industry-wide to about $14.99 on average. The DOJ’s lawsuit suggests that the negotiators and attorneys involved may have neglected to thoroughly analyze whether their agreement would truly create value for consumers—and thus whether it fell within the parameters of U.S. antitrust law. In the flush of hammering out a deal that appears to create synergy for everyone involved, negotiators sometimes neglect to consider how their agreement could affect outsiders, an oversight with ethical and legal implications. After being elected mayor of Chicago in February 2011, Rahm Emanuel, President Obama’s former chief of staff, took a series of actions that alienated Chicago schoolteachers, such as rescinding a promised pay raise and lobbying the Illinois state legislature to limit the issues the Chicago Teachers Union (CTU) could negotiate and strike over. In mid-2012, failed contract negotiations between the CTU and the City of Chicago led to a 10-day strike. The CTU and the school board eventually reached an agreement that provided victories for both sides, including a longer school day and annual teacher raises. When a conflict looms, it can be tempting to try to make unilateral decisions on key issues for fear that negotiation with the other side will be a dead end. This strategy may pay off in the short term, but it’s important to factor in the long-term cost of a backlash. Emanuel’s experience proves that tough combatants don’t always make famous negotiators. In early February 2012, following months of difficult negotiations, the attorneys general of 49 states and the Obama administration reached a settlement agreement with five of the nation’s largest banks aimed at stabilizing the U.S. housing market and punishing the banks for foreclosure abuses, the New York Times reported. Some analysts cheered the agreement as a positive sign that the country was beginning to move on from the housing crisis. But others criticized it for helping only a fraction of affected homeowners. This reflects the difficulty of balancing multiple goals in complex multiparty talks, even for famous negotiators — a challenge that stronger communication and negotiation within each party could help to resolve. The Obama administration’s powers of diplomacy were put to the test in the spring of 2012 when Chinese dissident Chen Guangcheng made a dramatic escape from house arrest to the American Embassy in Beijing on the eve of the United States and China’s annual negotiations on strategic and economic issues. Negotiations between U.S. and Chinese officials involving Chen’s fate were conducted under top secrecy, at the Chinese government’s insistence. Only after Chen decided he wanted to leave China for the United States did Secretary of State Hillary Rodham Clinton, one of the most famous negotiators of 2012, broach the topic of his fate with her Chinese counterparts, and even then she did so indirectly. Within hours, the Times reports, the Chinese announced that Chen had been granted permission to study in New York. “Face is more important in Asian society than any contract,” one senior American officials told the Times, emphasizing China’s need to keep the sensitive negotiations under wraps and speak only indirectly about Chen. The talks illustrate the potential value of adapting to your counterpart’s negotiating style in international negotiations. Beginning in 2011, the United States negotiated for many months with the erratic, secretive leadership of North Korea. The drawn-out talks began in the era of Kim Jong-Il and, after his death, resumed under the new regime of his son Kim Jong-un. On February 29, 2012, the countries announced an agreement in which North Korea promised to freeze its enriched-uranium weapons program and its long-range-missile activities in exchange for large amounts of U.S. food aid. But just 17 days later, North Korea sabotaged the deal by announcing plans to launch a satellite using a long-range missile. On April 13, North Korea launched its rocket, which exploded in midair. Some of the world’s most famous negotiators frequently dealing with untrustworthy counterparts, and they know it can be worthwhile to negotiate a “test” agreement within which you make only a few concessions, but be sure the consequences of reneging are explicit to the other party. Prepare for the potential consequences of a broken deal, including damage to your reputation. In a White House meeting on March 5, 2012, Israeli Prime Minister Benjamin Netanyahu expressed skepticism that international pressure will succeed in convincing Iran’s leaders to halt the country’s nuclear program. Netanyahu reportedly told President Barack Obama that the West should not reopen negotiations with Iran until it agreed to suspend its uranium enrichment activities, according to the New York Times. Obama, a patient and famous negotiator, is said to have disagreed, saying this condition would doom talks from the start. He urged Netanyahu to give economic sanctions and diplomacy a chance to work before considering military action. Meanwhile, some Republicans expressed impatience with the notion that U.S. negotiations with Iran could be effective. Instead of writing off a negotiation with someone you deem to be evil, irrational, or unethical on principle, advises Program on Negotiation chair Robert Mnookin, a famous negotiator in his own right, thoroughly analyze the decision of whether to negotiate, including the potential costs and benefits. Examine factors such as your interests, the other side’s interests, your alternatives to the negotiation, the shape of a potential deal, the various costs you might incur, and the likelihood that you can successfully follow through on a deal. On June 5, 2012, another casualty in the European debt crisis emerged, as Spain announced that it soon would be unable to borrow in the bond market without assistance from other European Union nations. Spain’s announcement launched unofficial negotiations over a deal to rescue the nation’s banks. As the euro zone’s fourth-largest economy, Spain was considered too big too fail. By demanding emergency aid for its banks, Spain tried to avoid the austerity measures and deep recessions faced by smaller nations such as Greece, Portugal, and Ireland. This lack of a unified, guiding fiscal policy gave Spain and other troubled countries negotiating power—possibly at the expense of the broader European economy. This is one of the negotiation examples that illustrates the value of establishing ground rules and policies before a crisis hits to make sure that you are playing on a level, fair field. On August 2, 2012, former U.N. secretary general Kofi Annan, another of the world’s most famous negotiators, announced he was resigning as the special peace envoy of the United Nations and the Arab League to the conflict in Syria. The peaceful uprising against President Bashar Assad that began in early 2011 eventually exploded into a civil war. Annan had negotiated a proposal that called for the Syrian government to withdraw heavy weapons and troops from populated areas and for opposition fighters to disarm. The proposal also detailed a process for political transition that included replacing Assad. Assad vowed to abide by the peace plan, but his government never took steps to implement it; nor did the rebels put down their weapons. Annan had received unanimous backing from the U.N. Security Council, but Russia and China, which had veto power, opposed additional coercive measures that might have imposed a change of government by outside powers or foreign military intervention. The United States, Britain, and France clashed with Russia and China on the issue. Insufficient pre-negotiation with Security Council members prior to the drafting of Annan’s proposal may have contributed to the international conflict over the terms of the deal and its implementation. The resignation of this famous negotiator underscores the importance of securing a mandate to negotiate from one’s constituents before engaging in a significant negotiation or conflict-resolution effort. Soon after his reelection in 2012, Obama signaled some flexibility on the issue of whether tax rates for affluent Americans should go up as part of a negotiated plan with Congressional Republicans to reduce the deficit and avoid the “fiscal cliff.” But weeks later, Obama did an about face, saying he would insist on higher tax rates for on top earners. Many Republicans in Congress said they would not support a tax increase for any Americans. In early December 2012, however, some Republican leaders reportedly were weighing a “fallback position”—legislation to extend middle-class tax cuts while delaying more difficult negotiations over spending and taxes until late January or February 2013. The Republicans’ search for a compromise reflected their relatively weak BATNA, or best alternative to a negotiated agreement, as compared to that of the Democrats. In this case, polls boosted Obama’s reputation as a famous negotiator, suggesting that most Americans supported tax increases for the top 2% and would blame Republicans more than Democrats if the country went over the fiscal cliff. Moreover, the cliff itself was a better BATNA for Congressional Democrats than for their Republican counterparts, as the spending cuts and Clinton-era tax codes that would be triggered were less onerous to Democrats than Republicans. In their most important negotiation examples, business negotiators can learn from famous negotiators that they would be wise to spend a great deal of time thinking about what would happen in the event of impasse in the current negotiation—and looking for ways to make their BATNA better. 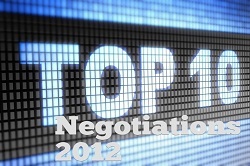 Which of our negotiation examples have worked for you? We’d love to hear what you have learned in the comments. Disney’s purchase of Lucasfilm looks like an interesting read as I thought Lucasfilm would never sell as this was an obvious sign that new Star Wars films were in Disney’s horizon which would upset a lot of fans.